Leeks, potatoes and minted peas, luxuriating in a white sauce beneath a cheese pastry crust is one of life’s simple pleasures. The warm waft of fresh vegetables being cosseted in a wrap of flaky pastry...need I go on? Part cook the prepared leeks in boiling water for 3-4 minutes then use a slotted spoon to remove them and put them in a bowl of cold water. Drain the leeks well and pat dry with absorbent paper. Place a layer of sliced cooked potatoes in the bottom of a pie dish, then a layer of the drained and dried leeks, then peas. Sprinkle parsley and salt and pepper as you build the layers and finish with a layer of the sliced eggs. Pour the white sauce over the contents of the pie dish then cover with cheese pastry and brush with beaten egg. Bake in the oven for about 45 minutes. 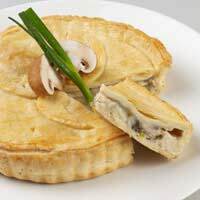 * Double the quantity of pastry if you want to make a double crust pie-so that the vegetables are completely enclosed in pastry. Cook the prepared onions in boiling water for about 15 minutes until tender, then drain and cool them before chopping them into chunks. Divide the pastry into two equal sized portions and use one half to line an 18cm pie dish. Cover this with the onions and half the cheese and sprinkle a little nutmeg, salt and pepper over it, along with the Worcestershire sauce. Finish the filling by sprinkling the remaining cheese on top and use the other half of the pastry to cover the pie. Brush the pastry lid with a little milk to glaze and make a small air vent in the middle of the pie to let steam escape. Now bake in a preheated oven (200C) for about 30 minutes, until the pastry lid is golden brown. Wash the aubergines and remove stalks, then slice the aubergines in half lengthways and sprinkle with a little salt. Heat the oil in a frying pan and gently fry the onions and peppers for about 4 minutes then remove pan from the heat. Place the whole tomatoes in a jug of boiling water and leave them for 2 minutes then remove with a slotted spoon. Once they have cooled enough to touch, the skin can be removed and the tomatoes roughly chopped. Dry the aubergines with absorbent paper and chop them into chunks. Cut the courgettes into chunks, too. Mix all the ingredients together in a deep pie dish and sprinkle with parsley, salt and pepper. Bake the pie in a preheated oven (200C) for 35-40 minutes.